Love is well and truly in the air, and even the coldest of hearts will be thawed by the loveliest romantic news of the festive season. 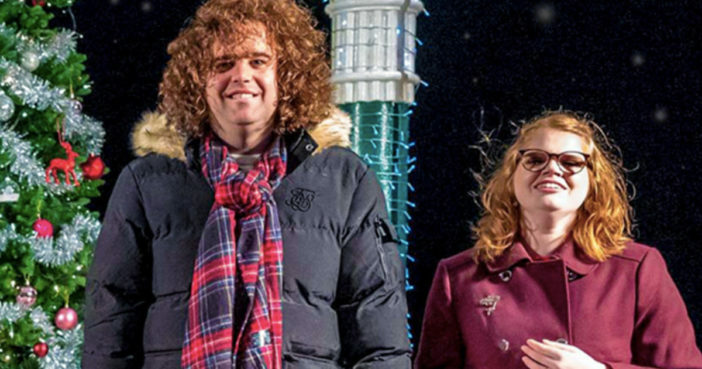 Musician Daniel Wakeford, from Brighton, was an instant favourite when he first appeared on Channel 4‘s The Undateables, with viewers rooting for him to find love. His immortal line, ‘we might go to Eastbourne’ when asked by a potential girlfriend what the future could hold proved particularly endearing. Due to his autism, the 30-year-old singer-songwriter has difficulties with communication and understanding others, meaning the world of dating has proven difficult. When he found a kindred spirit in Lily Taylor, viewers couldn’t have been happier. Daniel and 23-year-old Lily, met last year on a special Christmas episode of the show. Both were shown excitedly getting ready for their date, but neither could have guessed how brilliantly they would get along. Admitting she was looking for the sort of man who would be in a boyband (‘like Daniel!’), thoughtful Lily brought Daniel an advent calendar. The perfect gentleman, Daniel complimented Lily’s ‘beautiful’ red hair and ‘smart’ dress, and asked about her taste in music. It was clear the pair greatly enjoyed each others company, and a year on, they’re about to embark on the next step in their relationship. Yes, Daniel’s ‘Christmas girlfriend’ has now become his Christmas fiancé. During a festive episode, set to be broadcast December 18, fans will see Daniel propose to his beloved Lily; serenading her with the Christmas classic All I Want For Christmas Is You while accompanied by a choir. Daniel proposed at Lily’s favourite place, the Brighton Bandstand; getting down on one knee and slipping a sparking diamond ring on her finger. An overjoyed Lily accepted. I did it! We love each other. I’m feeling very excited. What’s the best feeling in the world? Love. I’m so very happy Daniel proposed. We’re getting married! I love him very much. We absolutely sobbed our socks off with joy. She has won the love lottery. Daniel is perfect for her. They really understand each other. When he found Lily, all his Christmases came at once. We’re just so proud of what Daniel has achieved with his music. I think back to when he was young and he was very shy, and now he’s entertaining thousands of people who love him for who he is. It’s so important too in changing society’s perceptions of what people with learning disabilities can achieve. To see his relationship with Lily blossom has been wonderful. Congratulations Daniel and Lily! What a perfect love story for Christmas. The Undateables: A Festive Proposal will air 9pm, Tuesday December 18 on Channel 4.